It gives us great pleasure to introduce our new Pro Photo Tips contributors - Joe and Mary Ann McDonald! Joe was one of the key reasons for Jenny and I getting hooked on photographing African wildlife. Back in 1995 we bought our first two wildlife photography books - Designing Wildlife Photographs and The Complete Guide to Wildlife Photography both by Joe McDonald - plus a Minolta Dynax 7xi camera and that was our kickoff! Since then we progressed to Nikon gear and bought another of Joe's books, Photographing on Safari, which we think is still the definitive guide for wildlife photographers who are shooting in African national parks. For those of you who may not know about Joe and Mary Ann, they have been winners of the BBC Wildlife Photographer of the Year contest 14 times and they have published seven wildlife photography books! On a regular basis Joe and Mary Ann will contribute a Photo Tip or answer a Photo Question so that you can learn something new. Each of these photo tips are aimed at photographers who want to improve or sharpen their nature photography skills and make images that get a second glance, whether you are a beginner or pro photographer there will be something for everyone. 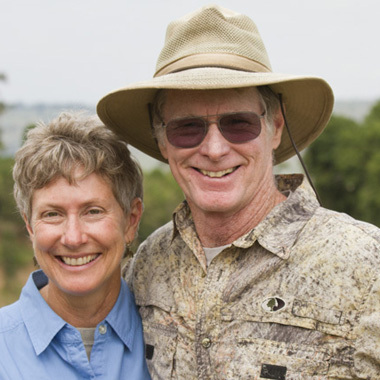 Joe and Mary will provide digital tips, advice on wildlife, hints on photo equipment as well as field tips so you can make images that you never thought achievable. If you have a question for Joe and Mary please let us know as your question could be one of the next pro photo tips to be featured here.